“Strengthened by the goodness of winter fruit, I brought the fire into the house. The civilization of storms dripped from the overhanging tiles. I’ll now be free to detest tradition, to dream of the frost of those that passed on the scarcely captious pathways. But to whom will I entrust my unborn children? Solitude was without its spaces; the white flame sank and its warmth only offered an expiring gesture.”- René Char, from End of Solemnities. The winter has arrived ahead of itself. It’s been cold here, bitter. You could almost taste it, the bitterness. We don’t go coatless anymore. And how it eats. The rise of sudden chill that surges and floods. In my heart I become the winter, as skinless as the weather that threatens to consume. The harshness, the bitterness, the numbness. Possession is all I ask for. I’ve always thought we grow greatest from cold places. And I’d gladly become coated in the winter of you. I wanted to sing for the winter, sing for you, but singing only ever comes with the promise of screaming and the cold has left me throatless. White Chocolate and Ras el Hanout Ice Cream. It’s an ice cream that far exceeds delicious. With a supple, creamy, and smooth-as-anything texture, it's heavenly. The base is a custard deeply enriched with sweetness and spice. I discovered ras el hanout when I was in the Middle East and I haven't been without it since. The spice provides an earthen undertone like nothing else. And when paired with ultra-sweet white chocolate in ice cream? It’s perfect. A wintered mouthful of richness and flames. 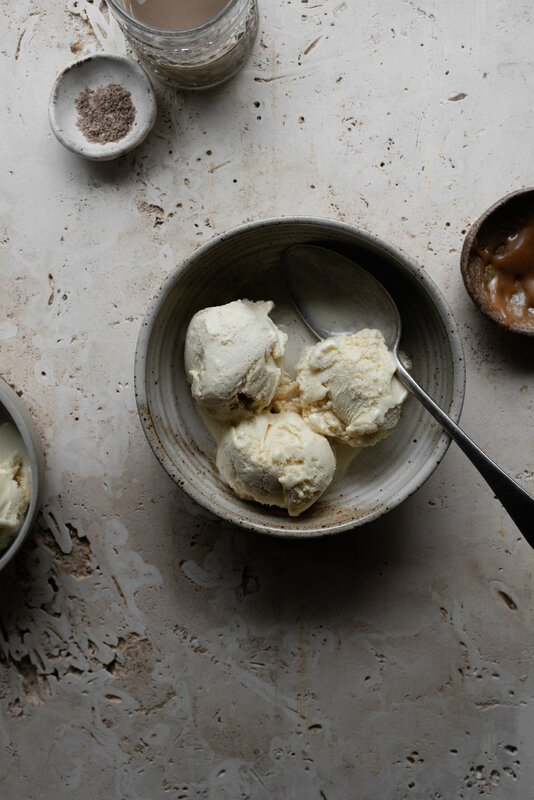 The warmth from ras el hanout is what makes this ice cream. It contains all the good things like saffron, cardamom, nutmeg, pepper and cinnamon. The spice isn't commonly found in most places, though, I have seen it carried in some specialty stores. If you can’t find it in stores, it can easily be sourced online. I wouldn’t recommend doing the ice cream up without it. You will need an ice cream machine for this recipe. Make sure to freeze your bowl overnight before use and also make sure that the custard base is completely cold before churning, too. I prefer to make the custard in the afternoon then let it chill overnight before churning the next morning. I use smoked fleur de sel in this recipe for a deep and intense undertone. You can easily substitute it for regular salt or standard fleur de sel. In the bowl of a stand mixer fitted with the whisk attachment, whisk the eggs and sugar on medium-high speed until pale and doubled in volume, about 3 minutes. Meanwhile, put the cream, milk, vanilla bean seeds, and ras el hanout into a large saucepan. Set the pan over medium-low heat and whisk often until the mixture reaches a gentle simmer. Once simmering, ladle a little of the hot cream mixture into the bowl with the egg yolks and whisk vigorously until combined. Pour the mixture back into the saucepan. Continue to cook, whisking constantly, until the mixture is thick enough to coat the back of a spoon. Do not let it come to a boil. Remove the saucepan from the heat and immediately whisk in the white chocolate and salt until melted and evenly combined. Strain the custard through a fine-mesh sieve and into a large mixing bowl then cover it with a layer of plastic wrap. Place the bowl in the refrigerator to chill the custard overnight until completely cool. The next morning, remove the bowl from the refrigerator. Pour the chilled custard into the bowl of an ice cream churner. Churn according to the manufacturers instructions of your ice cream machine. The ice cream will be very thick and almost doubled in volume when it is done churning. Scrape the ice cream into a large size loaf pan and cover it with a layer of aluminum foil. Freezer for at least four hours before serving.